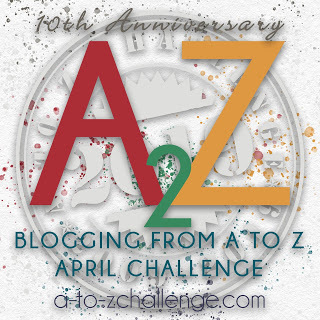 Lynda Grace An Hour Away: A-Z April Challenge I is for L' Italia è bella"
My father's parents were from the Province of Pescara in the region of Abruzzo. I’ve never been there. I don’t remember my grandparents speaking about their life back in the old country. They may have talked to us about it, but we were probably too young to be interested. 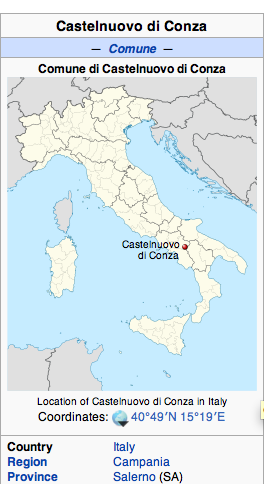 My mother’s parents were from Castelnuovo di Conza in the region of Campania in the Provence of Salerno. About 8 years ago, Ross and I visited Castlenuovo along with my sister and brother-in-law. My grandmother’s first cousin still lives there. She is quite eccentric. My brother-in-law was born in Italy. He has lived in the US for many years now. He was our interpreter when we wanted to communicate with our cousin. At first she was quite suspicious of us. But once my brother-in-law explained who we were, she invited us in for a cup of coffee. 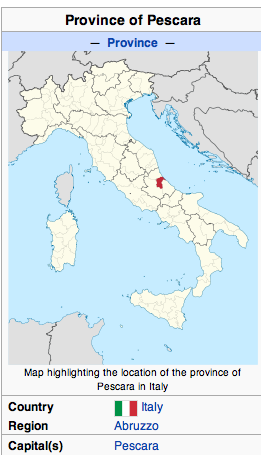 It is quite mountainous in that part of Italy. We were amazed that my grandparents were able to make it down the mountain, to Salerno and then to the port of Naples. I know that my grandmother was only 16 when she came to the USA. Her father, my great-grandfather, came to the USA first. Once he arrived and got settled, he was then going to send for his wife and children. Several months went by without any word from him. My great-grandmother sent my grandmother to come to the US to look for her father. She never found him and to this day, no one knows what happened to him. According to my mother and my aunts and uncles, my grandmother would not talk about it. I wonder if she did find out what happened and that’s why she wouldn’t talk about it. Even though my siblings and I are second generation Italian Americans, we grew up with many of the Italian traditions, especially the food. On Sundays my mother made the “gravy”. That’s what we called pasta sauce. And, by the way, pasta was macaroni. My grandmother spoke English but was more comfortable with her native language. I remember sitting at her kitchen table listening to her speak to her friend in Italian. By the time I was 25, all four of my grandparents had passed away. My mother and father are now gone also. Only a few of my aunts and uncles are still alive. Sadly, now that I am interested in my heritage, and have so many questions, they are not here to give me the answers. I want to know what was it like to grow up in their little towns. I wonder what it felt like to cross the seas to come to a place that must have been so unlike where they came from. I know that all four of my grandparents were single when they came here, but I don’t know how they met their spouses. I regret not learning how to speak Italian. I am proud of my Italian Heritage, but the little I know is not nearly enough. I did learn how to make the “gravy”, meatballs and lasagna. It is a favorite of my kids, and now grandkids. 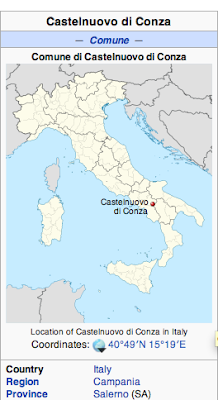 So, fino alla prossima volta. If your great grandfather came to the US, he had to have gone through immigration somewhere. Unless he changed his name (which is extremely likely if he didn't want to be found), you should be able to find his name on census information. It's also quite possible that your grandmother did know what happened to him and never talked about it for whatever her personal reasons. There were just some things that were never discussed. For example, everyone in my grandmother's and grandfather's family knew that my grandfather had a child from his first marriage...everyone except my mother and me, including cousins that were younger than my mother. I think it happens so often that when we are old enough to be interested, the people who can answer the nitty, gritty questions are gone. I know quite a bit about my father's parents, having had a very close relationship with them. Much less about my mother's parents, and almost nothing from generations before my grandparents. That's why ancestry.com has become such an addiction for me. Though I do have to say that finding new things out (and I've recently had some pretty major breakthroughs on my dad's lines where I had dead ended a while ago) is sometimes bittersweet because every time I get new information, it makes all the information I know I'll never have that much more specific--so I miss it more. If that makes any sense.